Grilled Jeff Novick Bean Burgers topped with my Hatch Green Chile Sauce, and some baked, fat-free, Sweet Potato Fries. Ok, they’re more like Sweet Potato “Bites” than fries. But they are still pretty darn good. I was hoping for more of a crunch, but because these Sweet Potato Fries are completely fat-free, with no added oil, getting a mild crisp around the edges was all I could manage. Still – judging from the fact I used 3 large sweet potatoes, and there wasn’t a single nugget left – I’d say they passed the test. I should mention my son-in-law, Mr. Fast Food Carnivore himself, even snarfed these up. Yes I said snarfed. I think that was a 70’s word. Duuuuuude. Start with 2-3 large sweet potatoes. They’re red – so maybe you call them yams. You want to peel them and try to cut them into even sized chunks. Then drop them into a large pan filled with enough cold water to cover them completely. Don’t boil the water first and then drop them in, this will end up cooking them unevenly in the end. Start with cold water. That’s the ticket. When the water finally starts to boil, set the timer for about 4 minutes. After the 4 minutes is up you can turn off the heat. Drain them real good, and then throw them back into the pan. Now add 2 level tablespoons of flour, and whatever spices you like. For these, I used 1/2 tsp each of onion power, garlic powder, black pepper, salt, and chili powder. Just toss the flour and spices right into the pan with the potatoes. Preheat your oven to 450 degrees and get your cookie sheet ready. If it’s a non-stick cookie sheet, excellent. Mine – not so much – so I used parchment paper to line the bottom. Put a lid on the pan and – are you ready? Shake it baby, shake it. (you ever see those silly shake weight commercials….yeah something like that). What you’re doing (besides looking ridiculous) is marring the edges and coating everything with your spices. Come on sing it with me…. But….only for like 5 seconds or so – just enough to coat everything nicely. If you shake it up TOO much you’ll end up with mashed potatoes…..not good. Now plop them down on your cookie sheet – spaced evenly – give each one some room – and bake them for 20 – 30 minutes. Keep watching until they start to brown. They’re done when they are as crispy as you like. I must say they go exceptionally well with Jeff Novick’s Bean Burgers right off the grill. I posted a link earlier but here’s another one in case you missed it. 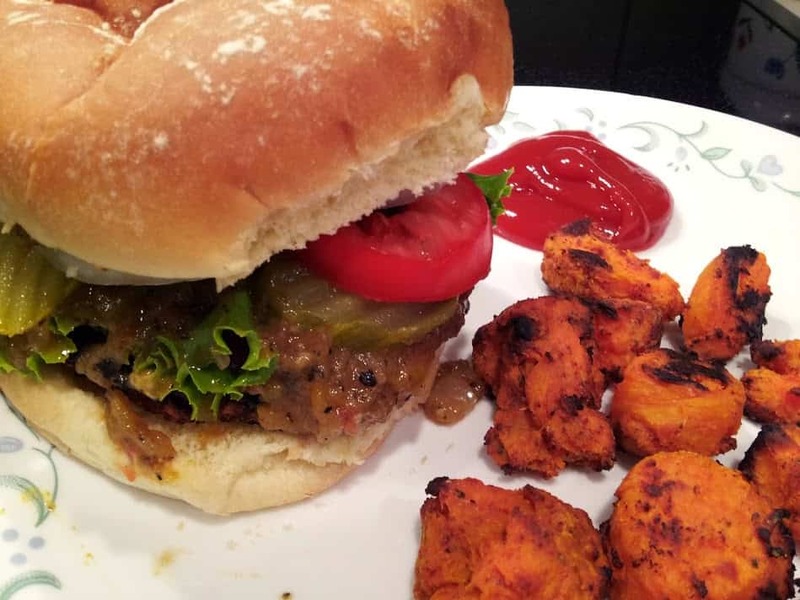 These burgers are amazing and only use 4 ingredients. Kidney Beans, Brown Rice, Rolled Oats, and Tomato Sauce. You can spice these burgers up by using different tomato products, ketchup, barbecue sauce, or in my case I used some leftover Marinara Sauce. Top off with some fresh garden veggies, and maybe some fresh Hatch Green Chile Sauce and dinner….is served. Crispy, healthy, sweet potato fries. Baked - not fried so completely 100% fat free. Perfect with freshly made bean burgers, hot off the grill. Ooh, that shaky thing is what I do with my roast (white) potatoes, I never thought to do it with sweet potatoes! sweet potato bites look great! bean burgers and sweet potatoes are the best combo. I may have to try both. We just got a bunch of roasted Hatch chiles…and now I know exactly what to do with them! Tonight’s menu is Green Chile Stew! Expect a recipe soon! Sweet potatoes bake much better without boiling them first, that will be why they came out mushy. I am getting ready to do the sweet potato bites. What is the verdict? To boil or not to boil them first? I cut them in 4 chunks and boil them until not quite done-still firm to the fork. Then slice them in french fry size pieces. Can the silpat cookie liners withstand 450 degrees? Hi Chuck! Have you done your sweet potato bites in the air fryer yet? I’d like to try that….. should I boil them first or just put them into the air fryer raw? You know, that would make a good remake of a recipe. I’ll get back to you on that!